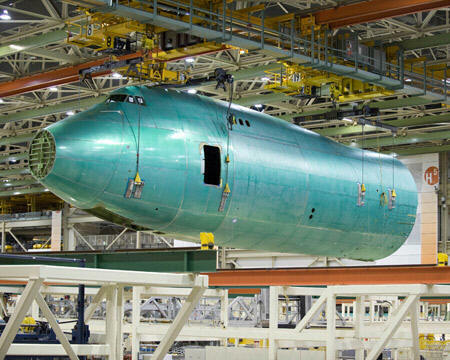 July 21, 2009, Everett, Wash., Boeing took a major step closer this week toward completing the assembly of the first 747-8 Freighter as mechanics at the factory in Everett, Wash. loaded the forward and aft fuselage sections to join with the wing and center section. "It is exciting to see this airplane taking shape," said Mo Yahyavi, vice president and general manager of the 747 Program. "The 747-8 is the largest commercial jet airplane we have assembled. This final body join provides us the first real look at the size of the 747-8 Freighter." The 747-8 Freighter is 250 feet, 2 inches (76.3 m) long, which is 18 feet and 4 inches (5.6 m) longer than the 747-400 Freighter. The stretch provides customers with 16 percent more revenue cargo volume compared to its predecessor. That translates to four additional main-deck pallets and three additional lower-hold pallets. The 747-8 Freighter is the new high-capacity 747 that will give cargo operators the lowest operating costs and best economics of any freighter airplane while providing enhanced environmental performance. 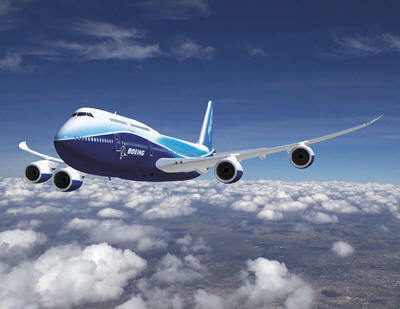 Boeing has secured 78 orders from leading cargo operators for the new 747-8 Freighter. Cargolux, Nippon Cargo Airlines, AirBridgeCargo Airlines, Atlas Air, Cathay Pacific, Dubai Aerospace Enterprise, Emirates SkyCargo, Guggenheim and Korean Air all have placed orders for the airplane. The Boeing 747-8 Intercontinental and 747-8 Freighter are the new high-capacity 747s that offer airlines the lowest operating costs and best economics of any large passenger or freighter airplane, while providing enhanced environmental performance. This latest family of the 747 jetliners meets airline requirements for a passenger airplane that serves the 400- to 500-seat market between the 555-seat Airbus A380 and the 365-seat Boeing 777-300 Extended Range airplanes, and a freighter that continues the leadership of the 747 Freighter family in the world cargo market. Boeing launched the airplane on November 14, 2005, with firm orders for 18 747-8 Freighters; 10 from Cargolux of Luxembourg and eight from Nippon Cargo Airlines of Japan. The combined list price value of the orders is approximately $5 billion. Boeing had been studying the market feasibility of a new 747 for some time, working with operators to establish their requirements for an incrementally larger 747 to continue the profitability of current 747 fleets. By working together with customers and applying the innovative new technologies of the 787 Dreamliner, Boe ing was able to create the 747-8 family. In fact, the designation 747-8 was chosen to show the technology connection between the 787 and the new 747. Both the passenger and freighter versions of the 747-8 will allow operators to maximize their profitability. Seat-mile costs for the 747-8 Intercontinental are 13 percent lower than the 747-400, with 2% lower trip costs. The 747-8 Intercontinental is more than 10 percent lighter per seat than the A380 and consumes 11 percent less fuel per passenger. That translates into a trip-cost reduction of 21 percent and a seat-mile cost reduction of more than 6 percent compared to the A380. The 747-8 is the only large airplane that fits today's airport infrastructure, giving airlines the flexibility to fly to more destinations. The 747-8 will build on the current 747's capability to fly into most airports worldwide, using the same pilot type ratings, services and most ground support equipment. With a range of 14,815 km (8,000 nmi), the 747-8 Intercontinental can connect nearly any major city pair in the world. The 747-8 family provides new revenue opportunities that will allow airlines to maximize profits. For example, the passenger airplane has 51 additional seats to accommodate 467 passengers in a typical three-class configuration and also offers 26 percent more cargo volume. The 747-8 Freighter offers a range of 8,130 km (4,390 nmi) and has 16 percent more cargo volume than the 747-400, which allows it to hold seven additional pallets with the same nose-door loading capability, industry-standard 3 m (10-ft)-high pallets and real-world cargo density capability at 159 kg/cu m or 9.9 lb/cu ft. Both airplanes represent a new benchmark in fuel efficiency and noise reduction, allowing airlines to lower fuel costs and fly into more airports at more times of the day. The 747-8 Intercontinental is 16 percent more fuel efficient than the 747-400, 11 percent more fuel efficient than the A380, and offers QC2 departures. With a maximum structural payload capacity of 140 tonnes (154 tons) the 747-8 Freighter offers 16 percent more revenue cargo volume than the 747-400F. The additional 120 cu m (4,245 cu ft) of volume mean the airplane can accommodate four additional main-deck pallets and three additional lower-hold pallets. The 747-8 Freighter enables operators to choose between carrying greater revenue payload -- up to an additional 20 tonnes (22 tons) -- or flying up to 1,400 nmi farther in markets where cargo density requirements are lower.